One of my all time favorite On Ice movie is the Cutting Edge. I love the first part better that the second and third part. I have seen all of it and it was pretty cool. It's fun watching all the awesome move on the ice. Btw, couchers will features "On Ice" movies this week so don't miss out to check them all out. Thanks to busy Kikamz for keeping the theme updated and hosting the movie meme despite of her busy sched and mommy life. Set against the backdrop of the 1992 Olympic Figure Skating Competition, the film centers on the life of Doug Dorsey, a brash, blue collar hockey player who is destined for stardom in the NHL until an overzealous opponent leaves him blindsided. In a last ditch effort to capture the Gold, he teams up with Kate Moseley, a prima donna pairs figure skater whose domineering talent and razor-sharp wit puts Doug on very thin ice. The Cutting Edge is a 1992 romantic comedy film directed by Paul Michael Glaser and written by Tony Gilroy. 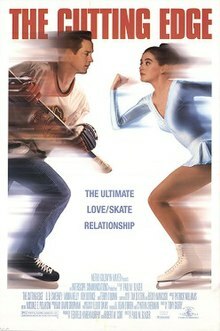 The plot is about a very rich, spoiled figure skater (played by Moira Kelly) who is paired with a has-been ice hockey player (played by D. B. Sweeney) for Olympic figure skating. They face off against a Soviet pair in the climax of the film, which is set at the site of the 16th Winter Olympic Games, in Albertville, France. The film was also shot in Hamilton, Ontario, Canada. Source from Wikipedia. This is definitely a great movie! It was directed brilliantly! haven't seen this movie, but the trailer looks good. maybe i'll just download this next time. Watched this movie a couple of times, pretty good! hmmm.. i've heard about this but i never get around to watching it. sounds really good! oh. i remember this movie; i was just a teenager when i saw this film. a very nice love story.